Scotland Yard issued a stark warning to drone enthusiasts yesterday, as it declared central London a no-drone zone. Police warned owners of drones that flying the devices over crowds or near landmarks in the city is against the law. The Met is receiving more reports of drones hovering over crowds at football stadiums and in shopping centers around the capital. Widespread availability of unmanned aircraft has sparked fears the devices could be used to harass and spy on people. 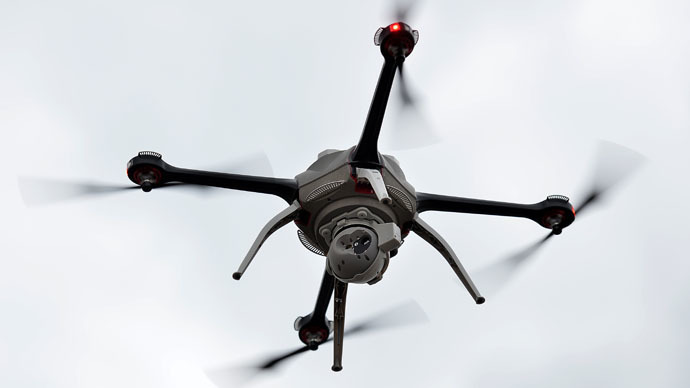 The warnings follow an incident at Heathrow Airport last July, when a drone came within 20 feet of a plane landing. The Airbus A320 was at 700 feet when the pilot spotted what appeared to be a small helicopter fly over the wing. A UK Airprox Board report into the near-miss classified it as an ‘A’ incident, meaning there was a high risk of collision. While the plane was able to land safely, the owner of the drone was never found. Two unidentified aircraft were also spotted flying over a French nuclear power plant on Saturday, sparking further fears about the security threat posed by drones. Chief Inspector Nick Aldworth told the Evening Standard: “I compare them to cars. They are perfectly legal to own but it is very easy to break the laws when you are driving." Police are also concerned about YouTube videos which are taken from drones flying over famous landmarks, such as the London Eye, Tower Bridge, and even the Shard. Drones are forbidden by law to be flown within 150 meters of a congested area, or within 50 meters of buildings not owned by their operator. Sales of the unmanned aircraft soared in the run up to Christmas, with the cheapest model available for as little as £35. “Sales are already around 2,000 a month,” Jim McCauslan, General Secretary of the British Airline Pilots Association, told the International Business Times (IBT) in December. Also speaking to IBT, a spokesman for the Civil Aviation Authority warned against a lack of regulation. “People can buy these things, they don't need to be licensed or registered, and you don't need any qualifications to fly them,” he said.